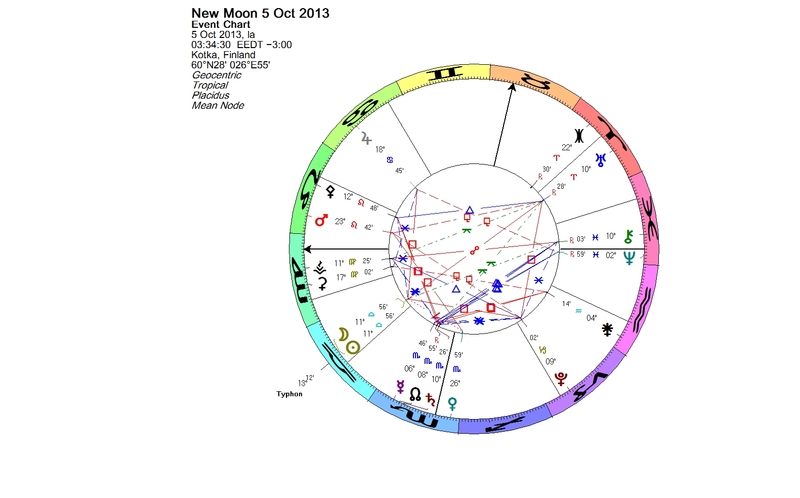 The New Moon, the conjunction of the Sun and the Moon, starts the monthly lunation cycle. When the New Moon occurs in conjunction with a planet, the whole month ahead can be colored by the symbolism of that planet. 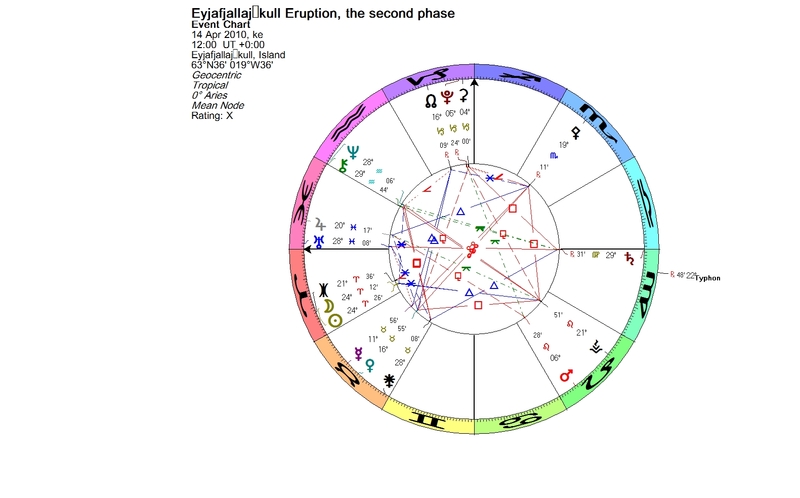 The New Moon on October 5 was conjoining Typhon, the namesake of the Greek mythological monster, whose name is considered to be a possible etymology for the word describing a tropical cyclone, typhoon. 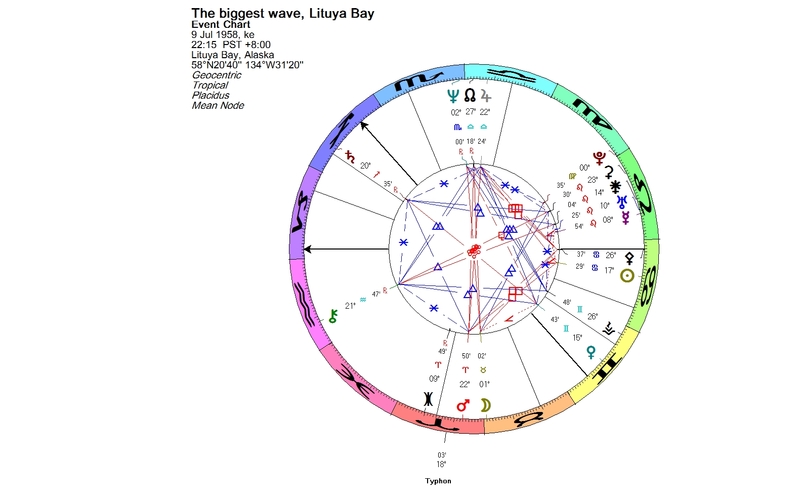 Since the Libra New Moon we have been reading about typhoons, cyclones and earthquakes emerging in different parts of the world. Even in Finland a giant white tornado, though not a natural phenomenon, but caused by an airplane, was seen in the sky and causing wonder. The shape of a spiral is characteristic for Typhon. The scattered disc object 42355 Typhon was discovered in 2002. Typhon is considered the first known binary centaur, when using an extended definition of a centaur. The companion Echidna was identified in 2006. In Greek mythology Typhon was a terrible monster who was the source of destructive storm winds and volcanic eruptions. He was so huge that his head was said to brush the stars. He shot hot rocks and fire from his mouth. Typhon was trapped beneath Mount Etna in Sicily by Zeus. Echidna was his wife. 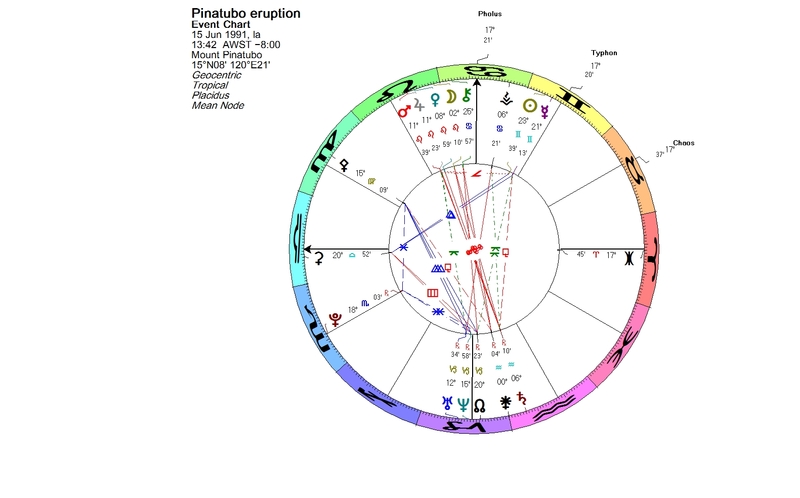 When typhoon Fitow made the landfall in China on October 7, 2013, soon after the Libra New Moon, the Sun and Typhon in Libra were in conjunction to the degree. Hundreds of thousands of people had been evacuated before the storm hit the coast. Fitow brought heavy rains, causing power cuts and travel chaos. Then there was typhoon Nari impacting the Philippines and Vietnam. Cyclone Phailin prompted India’s biggest evacuation in 23 years. According to hurricane researcher Brian McNoldy, “You really don’t get storms stronger than this anywhere in the world ever. This is the top of the barrel.” On October 12, 2013, Phailin made a landfall in Odesha as a very severe cyclonic storm. Because of the evacuation many lives were saved, but the material loss is massive. People have lost their homes and businesses. Around 12 million people may be affected. On the same day, October 12, 2013, an earthquake caused panic in Greece. The Greeks are used to quakes, but this one was strong and lasted long. Fortunately, it did not cause any serious damage. The quake occurred near Crete and was felt also in Israel. On October 15, 2013, a 7.2 magnitude earthquake shook the Philippines, killing more than 140 people and damaging buildings. The next day a powerful typhoon Wipha was threatening Japan. Luckily the storm weakened and passed the islands closely without causing any additional problems to the Fukushima nuclear plant. Typhon creates ash clouds. We still have fresh in the memory the eruption of Eyjafjallajökull in Iceland in April 2010, which caused enormous disruption to air travel in Europe over a period of six days. The ash cloud covered large areas of northern Europe sky, and about 20 countries had to close their airspace. When the first small eruption started on March 20, 2010, the Sun was at the Aries point opposing Saturn. Only a week earlier the Sun had opposed Typhon, and then passed over Uranus. The second phase of the eruption started on April 14, 2010, at the New Moon. By then the Sun had travelled to a quincunx aspect to Typhon, crossing Eris (the goddess of disorder) on its way. The ash plume rose to a height of approximately 9 kilometers – like a monster whose head reaches the stars. A typhoon making its landfall and one of the largest volcanic eruptions of the 20th century occurring at the same place on the same day is what happened in the Philippines on June 15, 1991. The conjunction of the Sun and Typhon was wide, but Typhon was also the focal point of a yod configuration formed by Pluto, Neptune and Typhon. In addition, Typhon was the midpoint of Pholus and Chaos, two other minor planets, which fit in the symbolism of that moment. The ash from the Mount Pinatubo eruption brought total darkness to the area. Typhoon Yunya’s rainfall mixed with the ash and formed a heavy blanket, which made roofs collapse. The effects of the eruption were felt worldwide, as the ashes reached high in the atmosphere. 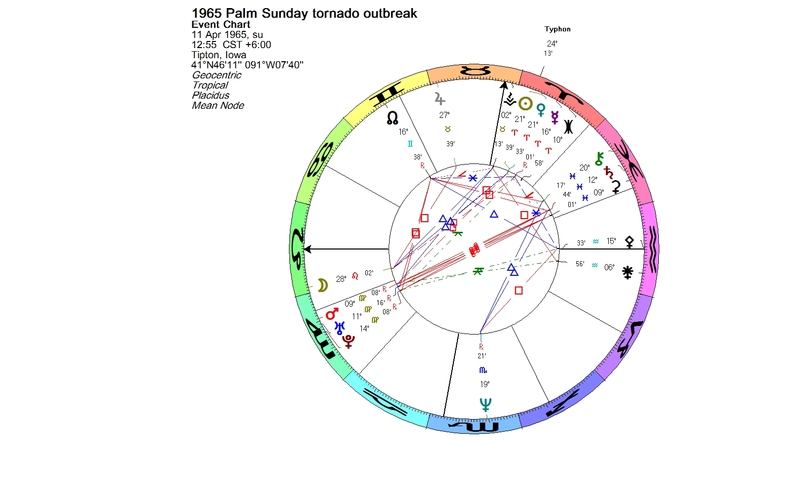 Another event which happened when the Sun and Typhon were in conjunction was the Palm Sunday tornado outbreak in 1965. It is among the most intense tornado outbreaks ever recorded. The Sun was squaring Typhon on July 9, 1958, when the largest known tsunami in modern times occurred in Alaska. Because of a big earthquake, a huge amount of rock and ice fell into the Lituya Bay and caused a wave of 516 meters in height. The event is known as the Lituya Bay megatsunami. There has always been, and will continue to be floods, hurricanes and other extreme weather events. However, human activity like deforestation and burning fossil fuels causes global warming, which increases intense weather phenomena. Just around the New Moon the news told, how a wave of hundreds of small earthquakes has been worrying people in Spain, in an area which normally is not known for seismic activity. A link between the quakes and work on a big offshore gas storage plant is suspected. The plant aims to inject gas in a depleted oil reservoir under the Mediterranean Sea. The Spanish government has now suspended the work. We feel helpless when facing the force of nature and natural disasters. There’s plenty we can do though as individuals and as part of our community. Not many of us have the courage to face a Russian prison, like Sini Saarela and other Greenpeace activists, for example. But it does not have to be something big, because our everyday choices count. 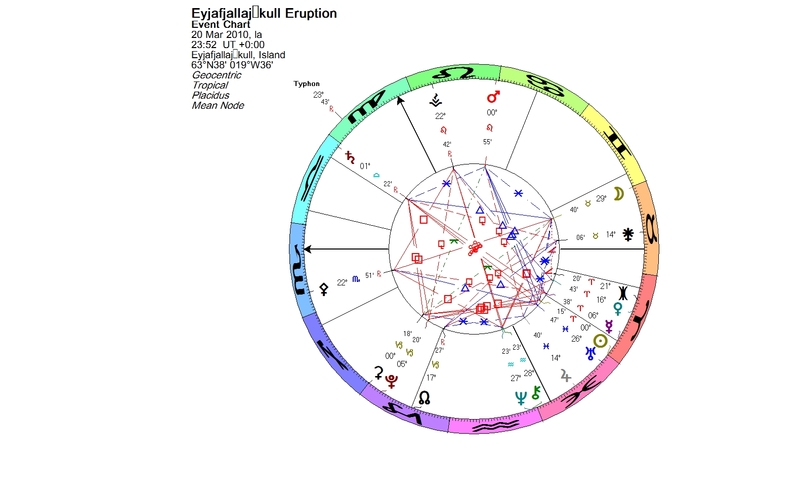 The first Earth Day celebrations on April 22, 1970, took place when the Sun was conjunct Typhon in the first degree of the earth sign Taurus. Now that degree is occupied by the conjunction of Bienor and 1992 QB1. Bienor can give us strength and initiative to challenge ourselves. The Aries Full Moon last night was a Lunar Eclipse in vicinity of Bienor, and eclipses are famous of their ability to move stuck energy and push us on a new path in life. This is a good time to start listen the Earth and take responsibility of its future, even in small ways. You are currently browsing the Lunations by Kirsti Melto weblog archives for October, 2013.